When you know you’re going to see a musical based on the George A. Romero film, “Night Of The Living Dead,” you’re expecting either a lot of blood and gore or perhaps some silly songs turning it into a tongue-in-cheek like “Evil Dead-The Musical” currently playing at Stray Dog Theatre. Instead this new musical is more of a cantata that builds suspense through tension and almost operatic recitatives with recurring themes of dread, puzzlement and anxiety. With the strong singing and acting of the New Line Theatre cast and the flawless direction of Artistic Director, Scott Miller, it is one of the most frightening evenings ever at a musical. A cantata is usually based on religious themes and there is some “praying” during the musical interludes that connect the zombie apocalypse but it reminded me a lot of Bernstein’s mini-opera, “Trouble In Tahiti,” with several musical elements blending to tell a compact but effective story. Especially effective were the three “Broadcast” sequences with alternate actors singing “We interrupt this broadcast” as the story from the radio or TV (the story is still set in 1968, the time of the original movie), is sung-through with the actors alternating bits and pieces of the emergency network broadcasts. Barbra’s frenetic plea in “Johnny & Me” is also quite powerful as is the calm delivery of Helen and Harry as they sing about a “Drive” in the country. 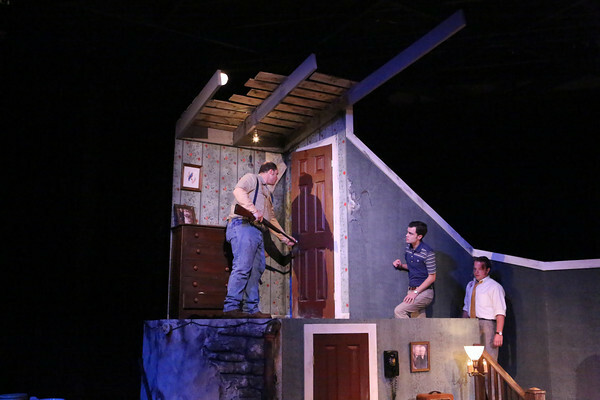 And again, snippets of most of the songs are repeated throughout the lengthy one-act to emphasize the confusion and frustration on this band of people who are thrown together at this abandoned house as the living dead attempt to get to get at them. Zachary Allen Farmer turns in another superlative performance as Ben. He’s the self-proclaimed leader as he enters the house and discovers Barbra cowering and unable to speak. Marcy Wiegert is superb as the vulnerable waif who can’t seem to comprehend what’s going on around her. Mike Dowdy and Sarah Porter also earn raves as a married couple with an ailing daughter who, for some strange reason, they leave in the basement during most of the action. She’s evidently suffering from a high fever and sleeping throughout most of the play. Phoebe Desilets plays the young Karen who finally emerges from under her covers as the finale draws near. Rounding out the cast are Mary Beth Black as Judy and Joseph McAnulty as Tom, a young couple who are just as freaked out and confused as everyone else trapped in this house. They also turn in convincing performances and bring strong voices to the eclectic score. The musical features music by Matt Conner, book by Stephen Gregory Smith and lyrics by Smith and Conner. This is quite an accomplishment for New Line’s artistic staff as well including an effective set and lighting design by Rob Lippert. He deals with four different acting areas including the front room, a kitchen, an upstairs bedroom and the cellar- all cleverly accessible without too much suspension of disbelief. He also provides highly effective visual effects including explosions and other activities outside the house along with the help of sound designer Kerrie Mondy. Sarah Porter and Marcy Wiegert also pull double duty as the costume designers with great results. The usual great job as well with the New Line Band, this time with Sue Goldford as conductor and piano along with an additional five members including another keyboard, strings and percussion. 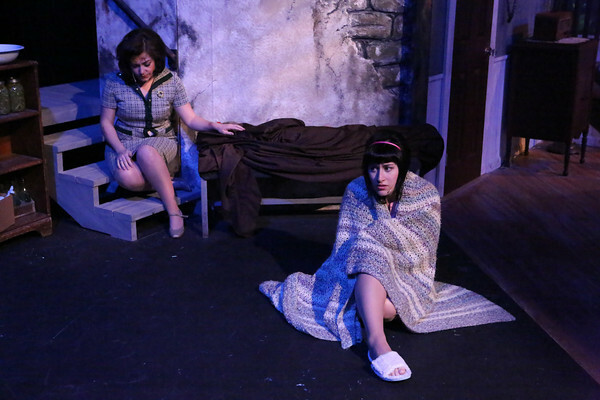 The fun and frolic of “Evil Dead” at Stray Dog and this more cerebral and psychological thriller, “Night Of The Living Dead” at New Line provide a great one-two punch for the upcoming Halloween season. Most of the pre-show talk with other audience members was whether we’d need plastic sheets for the splattering blood, but instead you had to get your mind wrapped around the terror of the unknown and unexpected as this amazing story unfolds in terrifying and compelling fashion. 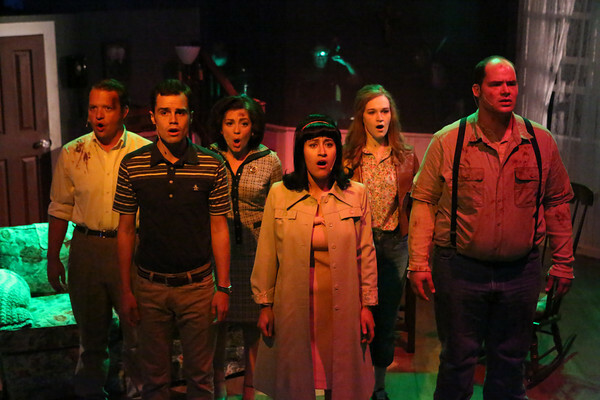 With the unusually beautiful score and the power of these fine actor/singers, “Night Of The Living Dead” is one musical you don’t want to miss. Evidently this is only the second production of the show nationally but, like so many other Scott Miller productions, news of this one should spread fast and it could become the new “cult” favorite. 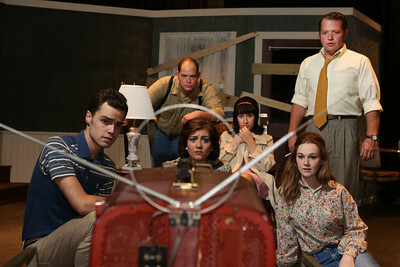 “Night Of The Living Dead” runs through November 2nd at the old CBC High School on Clayton Road. Call MetroTix at 314-534-1111 for tickets and visit newlinetheatre.com for more information of this production and the rest of the New Line Theatre season. This entry was posted on October 15, 2013 at 9:43 pm10 and is filed under Uncategorized. You can follow any responses to this entry through the RSS 2.0 feed. You can leave a response, or trackback from your own site.